The 'Stansted 15' had chained themselves to a plane and each other for 10 hours and lain down and occupied an access road not used for commercial flights, to prevent 57 people, from Nigeria, Ghana and other parts of West Africa, from being deported. Some of those being deported had legal hearings and unheard appeals pending. Their deportation, as well as being racist, was illegal. Deportations of homeless EU citizens and of African-Caribbean pensioners who have lived here for over 50 years, under ‘deport first, appeal later’ deportations, were recently ruled illegal by the Supreme Court. Thousands of people are deported on specially chartered flights each year to Nigeria, Ghana, Pakistan and Afghanistan. A replacement flight took off from Stansted airport two nights after the flight blocked by the activists with 23 people on board. The 'Stansted 15' action temporarily saved 34 people and drew attention to the violence of charter flights and Britain's deportation regime. It was the first time a deportation flight has been grounded by people taking direct action against Britain's racist immigration system. 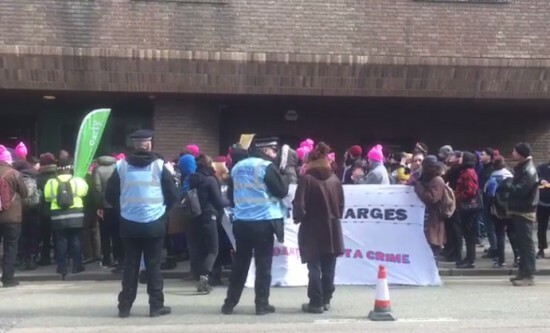 There has been massive opposition to the prosecution of the Stansted 15, not just from direct action groups, but also from establishment figures such as Labour MP David Lammy, Green Party co-leader Caroline Lucas, David Ramsbotham, the former chief inspector of prisons, Maxine Peake, the Shadow Home Secretary, and Vanessa Redgrave, who wrote to The Guardian condemning Britain as a ‘sordid, cruel, lawless country’. The trial has been adjourned until further notice. Drop the charges! Free the Stansted 15! Stop charter flights! No Deportations! The defendants are: Emma Hughes, Melanie Evans, May McKeith, Melanie Stickland, Lyndsay Burtonshaw, Laura Clayston, Helen Brewer, Ruth Potts, Jyoysna Ram, Edward Thacker, Nicholas Sigsworth, Alistair Tamlit, Benjamine Metters, Nathan Clack and Joseph McGahan.